2 × five = Required Please enter the correct value. The Dow Jones today was topsy-turvy, surging in early morning trading on increased M&A activity, only to turn down sharply after lunchtime. It finished up 0.53% to 16,447 points. The Nasdaq ended flat, down 0.03% to 14,074 points, and the S&P 500 was up 0.32% to 1,869 points. 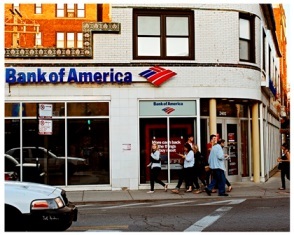 Capital Blunders: Shares of Bank of America Corp. (NYSE: BAC) slipped by more than 5% after the company announced it would halt buybacks and dividend hikes thanks to poor capital asset management. The company is now in the penalty box with the U.S. government, joining Citigroup (NYSE: C), and it will now need to hold greater capital. Wells Fargo & Co. (NYSE: WFC) analyst Matt Burnell wrote, "We believe the combination of reputational damage, upward pressure on expenses and potentially more conservative capital return request in 2015 will cloud BAC's share price performance for the next few months." Bank of America had planned to buy back $4 billion in stock and increase the dividend to $0.05 a share from $0.01. No Mining Deal in Place: Shares of Newmont Mining Corp. (NYSE: NEM) slipped by more than 6% on Monday after the company called off merger talks with rival Barrick Gold Corp. (NYSE: ABX). The Wall Street Journal reports that the two companies have spoken on at least three occasions to get a deal in order. Though Barrick's board is eager to get a deal in place, sources indicated that Newmont sees greater value in remaining independent for the moment. The Deal That Won't Die: Shares of AstraZeneca Plc (NYSE ADR: AZN) surged by as much as 15% on Monday after its rival Pfizer Inc. (NYSE: PFE) confirmed it was again renewing discussions to purchase the British pharmaceutical company. The early estimate for the deal places AstraZeneca's value at $98.7 billion. Pfizer shares were up more than 3.7% on the news. The Land of Lower Taxes: Who would have thought that lower taxes are a big boost to companies? This morning, Toyota Motor Corp. (NYSE ADR: TM) announced plans to relocate its operations into one location outside of Dallas, meaning the company's financial services unit will depart California. TM said in a statement that it will consolidate all of its operations into one headquarters location in Plano, Texas. The change will affect 1,000 jobs in California and will happen by 2017. The move is a significant blow to Southern California and part of a much larger trend of companies moving states to take advantage of a more favorable business and tax climate. The Employment Problem Continues: The New York Timespublished a staggering piece on the employment situation in the United States. It says that strip malls, fast food restaurants, and other low-wage employment destinations have seen their strongest job growth over the duration of the economy's recovery. The National Employment Law Project explains that the nation has replaced high-wage and middle-wage jobs with bad ones. How to Get in the Game and Profit: Once you make a decision to start investing, the next step is to make a commitment to become successful. You can't make money watching from the sidelines. But you can't be a deer in the headlights either. That's why Shah Gilani is going to show you how to make that next step…and become a confident trader for the future.